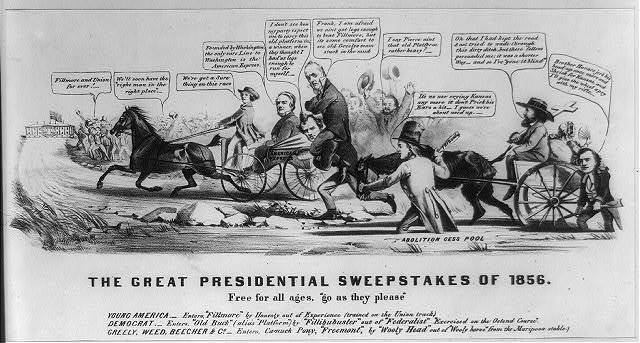 “The Great Presidential Sweepstakes of 1856. Free for All Ages, ‘Go as They Please’,” Louis Maurer, New York: Nathaniel Currier, 1856. This image, drawn from the perspective of a nativist, exhibits aspects of the various presidential candidates’ platforms for the 1856 campaign. Of particular interest is a carriage led by New York Tribune editor Horace Greeley. Carrying candidate John C. Fremont’s wife Jessie and a large sack, Greeley’s carriage is stuck in an “Abolition Cess Pool.” At the rear of the carriage, abolitionist preacher Henry Ward Beecher tries to force the back wheel using a rifle as a lever. Beecher’s speech bubble refers to Republican attempts to exploit the Kansas violence as an election issue, as well as to Beecher’s arming of antislavery settlers in Kansas.